Summary for the Busy Executive: Mostly pleasant dreams, lovingly played. I first encountered Raymond Leppard as the brilliant harpsichordist in Barbirolli's recording of Purcell's Dido and Aeneas. Since then, Leppard has continued as one of the finest conductors of his time – a supreme interpreter (non-HIP) of Handel and the Baroque and an incredible musician on everything else he's turned his hand to, including a landmark recording of the Virgil Thomson opera The Mother of Us All. For years he's headed the Indianapolis Symphony, and to some extent this has hidden his light, since media don't focus much attention on "secondary" cities. But Leppard has the rare ability to get music not only to move, but to bounce and to sing with lovely tone. Few of the works on the program, excepting the Barber, are all that well known. I'd never even heard of Thomas Canning before this CD, although I've since found the same work on a Telarc sampler and the Gothic catalogue lists a fugue from an organ sonata. I generally think of potpourris like this as mixed bags. Too often they fail to satisfy: you either don't care to hear the piece again, or the excerpt whets your appetite to hear the complete work. To some extent, that's the case here. Chadwick and Foote, although they lingered into the Thirties, really come from the late Nineteenth Century, musically speaking. Both belonged to the so-called "Boston school," which also included Horatio Parker (Ives' teacher) and Amy Beach. I tend also to associate them with Edward MacDowell (even though his career was mainly in New York), purely on musical grounds. They pretty much shared a certain point of view: Romantic, deriving from Schumann and to some extent Liszt and Raff. Within that narrow range, however, each has a distinct voice. Furthermore, for each the modern music of the time touched them: in the case of a late Nineteenth-Century American composer, this would have meant Tchaikovsky and Dvořák, both of whom had huge successes in New York and Boston in the 1890s. Dvořák influenced even the early Ives. I happen to believe both Chadwick and Foote get short shrift from those who think music can justify itself only by profundity. When Chadwick tries for something beyond the lyrical or poetic, the music begins to oversell itself. Foote's reach, in contrast, never exceeds a modest grasp. Schumann's "character pieces" lurk behind Chadwick's Symphonic Sketches. Each of Chadwick's sketches paints a picture: "Jubilee," "Noël," "Hobgoblin," and "A Vagrom Ballad." Chadwick manages to expand the short lyrical sketch to something genuinely symphonic a good deal of the time, but the effect remains something like a musical Washington Irving, rather than Whitman or Melville. "Noël" begins quietly and poetically, depicting the first Christmas Eve. The opening is the same kind of slow music as the "New World" largo, without the genius touches (like the opening chordal passage) that distinguish the Dvořák. Nevertheless, Chadwick comes up with something beyond imitation and cliché. However, Chadwick runs into trouble when he pushes for the Big Climax about two-and-a-half minutes from the end. It fails to convince, mainly because it's simply what we've heard before, only louder and to accompanying throbbing triplets. It reveals nothing really new about the musical material. Still, two out of three cheers. The pizzicato part of Foote's "Pizzicato & Adagietto" comes from Tchaikovsky – pieces like the Serenade in C for Strings and the Fourth Symphony scherzo. The work is really an adagio in a pizzicato frame, and it's the gently melancholic adagio where Foote steps out as himself. But the pizzicato is fun and not horribly imitative. The movement whets my appetite for Foote's entire Suite, available on the Albany label in a program of the Boston school. Barber's Adagio I've written about before, and in detail. It has long established itself as an American classic. Indeed, some over-enthusiast released a CD of just about all, if not all, sanctioned arrangements of the piece. As much as I love the work, a full CD of it over and over again daunts me. For me, the version to beat is Schippers and the New York Phil on Sony MHK62837. Leppard's version is modest, tasteful, and clean. 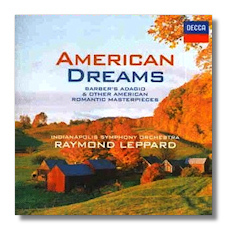 Leppard keeps the lid on and gets the orchestra to build and fall back with fine judgment – the interpretively difficult part of the piece. Apparently, Leppard (according to the liner notes) wants to connect to the madrigals and consort music that originally inspired Barber. It's certainly one way to hear the Adagio, but I miss the fire of Schippers and those glorious New York strings. John Alden Carpenter, a wealthy Chicago businessman who as a composer began slightly later than either Chadwick or Foote, fell early under for the spell of Impressionism. Later, he incorporated jazz and other modern developments into his music. For me, he definitely falls into the category of Minor Composer, and I confess to not liking his Impressionist work very much. Even second-string composers like Griffes and Dukas did it much better. I prefer his more angular Skyscrapers, near-Surrealistic ballet Krazy Kat, and his Gershwinesque piano concertino. Sea Drift, of course, calls to my mind Delius's score with the same name as well as Debussy's La Mer, neither of which comparison does Carpenter much good. It's almost all atmosphere and little substance, although it's beautifully orchestrated. There are even little "steals" from Debussy here and there. I've complained about the "noodling around" of post-Wagnerians. This is the Impressionist equivalent and rather weak-sister stuff when you remember that its inspiration derives in part from Whitman. Leppard, however, makes a great case for the work, far stronger than Hegyi on New World. Thomas Canning, who studied composition at Oberlin and Eastman, died in 1989. As I say, I know only his Fantasy on a Hymn Tune, based on Justin Morgan's Amanda. Morgan belonged, like the more famous William Billings, to the New England school of singing-masters. As a composer, he interests me even more than Billings does, especially harmonically – with unresolved semitonal dissonances sprinkled through his work. The text of Amanda (both the name of Morgan's wife and of a town in his native Vermont) is a fairly popular one of the time, and several composers set it: "Death, like an ever-flowing stream / Sweeps us away." I'm of two minds about what Canning has done. On the one hand, he's written a beautiful piece for strings, very much in the line of Vaughan Williams' Fantasia on a Theme by Tallis, particularly in the way he plays with various subgroups within the overall string ensemble. But Morgan isn't Tallis. His music is rougher and more biting. Canning smooths out all this. So while Vaughan Williams seems to extend Tallis, Canning glosses over the harshness of Morgan. Would this even be relevant if I didn't know the original setting of Amanda ? Probably not, but I do, so it bothers me. In about 1919, Gershwin wrote his Lullaby for string quartet as an instrumentation exercise for his teacher Edward Kilyeni. It interests me in that it predates not only Rhapsody in Blue, but also Gershwin's Broadway (though not popular) success. It shows, if nothing else, that Gershwin wanted to go beyond songwriting early on. The piece lasts about 8.5 minutes, but it's really a long song rather than an instrumental movement, with variation due primarily to instrumentation changes rather than thematic transformation. However, the scoring is highly effective and even unusual, considering the inherently monochromatic nature of a string ensemble, and the basic musical idea (there's really only one in the entire piece) hypnotizes. Gershwin never wanted to publish the work, although he did hand out private copies to string-playing friends, and because of Gershwin's name and saleability, someone finally did publish it. It's a morceau, but an enchanting one. I'm happy to know it. Hoagy Carmichael, another great songwriter (if he wrote only "Skylark," he'd be that), hankered to compose large instrumental works, like Gershwin. Late in life, financially bolstered by his royalties (I wonder what he made on "Stardust" alone), he embarked on a series of them. Gershwin, however, was an original as well as a genius. Carmichael seems more than a little at sea in a concert hall. He loses his usual raffish charm in this excerpt from his orchestral suite Johnny Appleseed. It's all rather bland stuff. The only thing worth mentioning is the slick scoring, undertaken (according to the notes) by "Van Cleve and Dant," by which I assume they mean Nathan Van Cleave and Charles Dant, two Hollywood orchestrators (Carmichael had a lovely movie career as well). Other than that, for me it's pretty much a wasted track. Leppard and his Hoosiers nevertheless do an exquisite job on everything. The orchestral sound itself is beautiful, the shaping of phrases lovely and detailed, and the overall flow of each piece unimpeded. Leppard knows how to tell the musical tale, especially evident in the Gershwin, which can pall in less committed performances. Based on the Chadwick and Foote, I especially want to revisit Leppard's Dvořák and Tchaikovsky.